Latest G.S.M. & P.S.T.N. based wireless security system with auto dial, SMS & two way conference (Hub to Phone), 99 wireless sensor & device support, 5 wired devices including one 12 V output. Fully SMS based control & custom programmable host. Support up to 6 custom phone / mobile numbers. GSM Security Alarm System function with quad GSM band support & detects suspicious persons using Infra Red rays which are radiated from the suspicious person’s body. Thus no scope for failure even in the dark. Your presence at the fortification are is no more an issue. You will get notification through SMS & the system will call you. While on the call, you can clearly hear the sound of the security zone. A two way conference between the security hub & the phone is even possible. You can raise the alarm (turn on the siren), turn on/of the 12 V output while on the call received from the security host at the time of emergency. 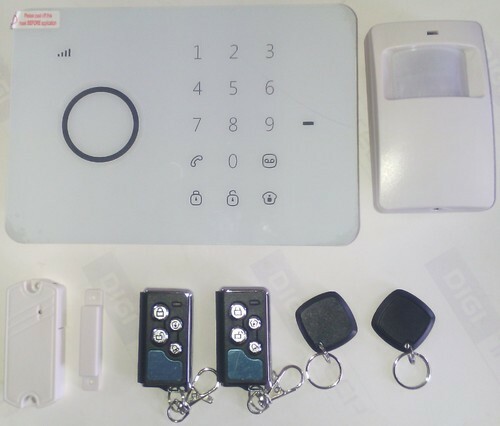 The GSM Security System is equipped with the capability to detect 99 wireless sensors of the appropriate frequency which includes Smoke Detector which raises an alarm whenever it senses the smoke of a fire, LPG Sensor senses leakage of LPG, Pet PIR which discriminates a pet (below 25 Kg) from the human intruder & thus prevents a false alarm. IMPERIAL, IMPERIAL ELECTRICAL APPLIANCES LTD.?to be more precise! We explore how technology and services can help people and companies address their problems and challenges, and realize their possibilities, aspirations and dreams. We apply new thinking and ideas to create more simple, valuable and trusted experiences with technology, continuously improving the way our customers live and work. We offer consumers a wide range of products and services from Home Automation & Security to large Enterprise Automation & Security. Our major dealings are primarily based on products like?G.S.M. & P.S.T.N. Security System, Multifunction Ozone Sanitizer, Veg Purifier, R.O. & U.V. ?Water Purifier, Fully Automatic , Water Level Controller & Motor Safety Device, Radio Frequency Based Remote Controller For Lights, Fans e.t.c., Kitchen Chimney, Geyser, Induction / Infrared Cooker, Packaged Food?Ingredients?& Fans That Will Follow Your Movement Which Will Sence Your Comfort Level.? This comprehensive portfolio helps us match the right products, services and solutions to our customers? specific needs. We are engaged in continuous Import & Export with countries like Nepal, Taiwan, Japan, Italy, Vietnam, Singapore & China.